It is newly independent in Nigeria. The story begins as the houseboy Ugwu is being taken by his aunt to his new master Odenigbo, a lecturer in mathematics at Nsukka University. He quickly fits into Odenigbo’s household and is witness to the middle class existence in the house. Odenigbo’s house is the favourite of argumentative lecturers who meet every evening over glass of wine and bottle of beer to discuss the state of affairs in their newly independent country. Among these lecturers is the remarkable poet Okeoma, modeled along the lines of the late Nigerian Poet Christopher Okigbo. It is a happy time for the characters, with hopes high for the newly independent country. Odenigbo co-habits with his London-educated lecturer sweetheart Olanna who refuses to marry him comfortable with the independence allowed in her come-we-stay liaison with him. 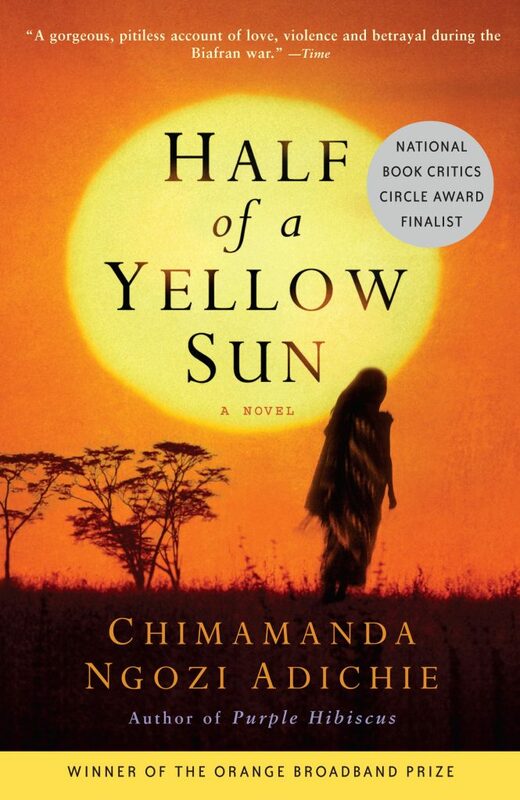 Before the eruption of the conflict, Chimamanda treats readers to a story of a normal family, with its share of ups and down, one instance of which is when Odenigbo out of the machinations of his mother sleeps with her companion from the village called Amala and gets her to conceive Odenigbo’s only child Baby, an affair of which Olanna gets to learn and in retaliation sleeps with Richard, the white boyfriend of her twin sister Kainene. As the family struggles with this crisis however, the nation is in a state of agitation. Igbo-phobia is rising and attacks against members of the tribe by their northern neighbours are on the rise. The recent turn of events is prompted by a political crisis emanating from the takeover of the country by military rulers led by Major Nzeogwu, an Igbo who did it ostensibly to clean the country’s politics of corrupt civilian leaders. The deposed leaders incite their tribespeople against the Igbo and within no time, hatred against them turns into open violence. In fact Olanna barely escapes death and travels in a train full of Igbo escapees, one of whom carries a basket in which she has kept the severed head of her daughter. Olanna herself had gone to visit the family of her Uncle Mbaeza, but found the entire family wiped out by their neighbours. The massacres have ignited a mass exodus of Igbo from the north towards their home province of Enugu, where the Igbo secessionist General Ojukwu has declared the Republic of Biafra, with its flag emblazoned with half of a yellow sun. The crisis sharply divides opinion among Odenigbo’s companions, with some like Okeoma taking explicit positions and joining the side of Biafran secessionists. For a time, the secessionists put up a fight against General Yakubu Gowon’s federalist forces. The federalists are however too strong for them, using all manner of arsenal against them among them aerial bombardment thus evicting the Igbo from some of their strongholds such as Nsukka. Odenigbo and his Igbo lecturer friends are forced out of the university and further into Enugu, where he joins the war effort as a junior officer in the War Manpower Directorate. It is a time for struggle as every means of punishment, including hunger and starvation is employed by the federalist government to compel the secessionists into submission. Richard, an Englishman who had taken the side of secessionists writes on the conflict, attempting to draw the international community’s attention towards happenings in Biafra but does so with little success. Eventually casualties are heavy on the side of the secessionists and they are forced into submission. One such heavy casualty is the death of the respected poet Okeoma. Despite the federalist announcement that there were no victors and losers, the secessionists are compelled into a federalist union they are ambivalent about. Crimes are committed against them, exemplified by a soldier’s unnecessary cruelty against Odenigbo as he drives his family back to Nsukka at the end of the war. There are irreplaceable losses, among them the disappearance of Kainene who never returns from her journey to get supplies towards the end of the war. Ugwu, a lad whose schooling is disrupted by the fighting and who at one time is conscripted into the Biafran army is revealed as the writer of the story of Biafra whose excerpts are ubiquitous throughout the novel. The silence of the outside world is indicted for the crimes against Biafra which it did not condemn. Through the novel, Chimamanda is able to revive a story of conflict and crime against humanity that the Nigerian government would rather forget. Okwaro Oscar Plato is an analyst with Gravio Africa . He is a columnist with The Nairobi Law Monthly. Critical Writing is the analyses, summary and explanation of any literary material. its analysing any art work, literary work or musical work from the part of a well informed perspective. it can be positive, negative or neutral. The modern media writer is expected to produce different types of writing for different purposes and for different publication. According to the critic of this work, he explained the plots, characters, its genre in literature, and other elements to consider in analysing critically. This critique is a good job, and it has passed through several stages of criticism.